﻿ Kielder’s bird population in for a surprise! Home > News > Kielder’s bird population in for a surprise! Migrating birds returning to Kielder Water & Forest Park this spring are in for a big surprise. 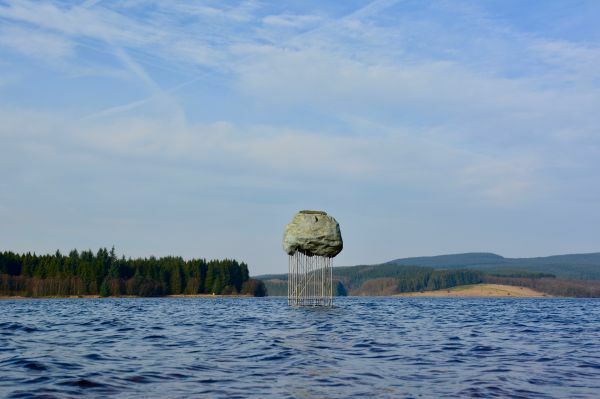 As part of the National Heritage Lottery Funded “Living Wild at Kielder” project and Kielder Art & Architecture, Plashetts Rising, a dramatic new sculptural commission, is now in place, emerging eerily from the depths of Kielder Water. Plashetts Rising, designed by FleaFolly Architects, draws inspiration from the nearby and now-flooded Plashetts Quarry, from which rock was quarried during the construction of the dam, as well as Plashetts Station, a halt on the Border Counties Railway that once ran through the North Tyne Valley but now lies deep beneath Kielder Water’s surface. As well as being a spectacular art installation, Plashetts Rising also serves as a giant perch and “fishing watchtower” for Kielder’s many bird species. The goshawk is a large hawk, almost as large as a buzzard. Both species are often seen at Kielder. Up close the goshawk has a fierce expression with bright red eyes and a distinctive white eyebrow. Its broad wings enable it to hunt at high speed, weaving in and out of trees, and its long legs and talons can catch its prey in flight. Another fascinating bird which can be spotted in the woods at Kielder is the crossbill. It is a chunky finch with a large head and a beak which is crossed over at the tips. This crossed beak is used to extract seeds from conifer cones – and so naturally, Kielder Forest provides this bird with an abundance of food. The male crossbill is a brick red colour and the females are a greenish-brown. Crossbills are most often encountered in noisy family groups or larger flocks, usually flying close to treetop height. They feed acrobatically, fluttering from cone to cone. There are many more species of woodland birds to look out for at Kielder including goldcrests, song thrushes, nuthatches and woodpeckers amongst the trees. Overlooking the water at Kielder’s Bakethin Nature Reserve you can also see many varieties of water bird such as mandarin ducks, little grebe, teal, goosander and tufted duck. Visit Bakethin Hide for an excellent viewing area. At dusk you will hear the sound of Kielder’s owls calling to each other across the trees. Kielder Forest is home to a large population of owls, who come out to hunt at night, so look around in the trees during the early evening too. And as the evening falls, don’t forget to take a last look at Plashetts Rising too, to see who’s settling down for the night on this wonderful, towering perch. “I would like to thank National Lottery players and the National Lottery Heritage Fund for supporting ‘Living Wild at Kielder’; a project that helps people experience and learn about the area’s special animals, birds and plants. Plashetts Rising is part of the Kielder Art & Architecture programme, which is supported by Arts Council England.